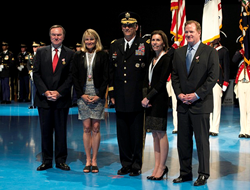 Dr. Van Dahlen, along with Mr. Mike Duke (former Chief Operating Officer and current Member of Board of Directors for Walmart), Mr. Roger Goodell (NFL Commissioner), and Mrs. Cheryl Jensen (Executive Director, Vail Veterans Program) were presented with the Army’s Outstanding Civilian Service awards during a day-long celebration yesterday in the nation’s capital. The men and women who serve our country are our husbands, wives, children, co-workers, neighbors and friends. It is up to each of us to do what we can to support them. 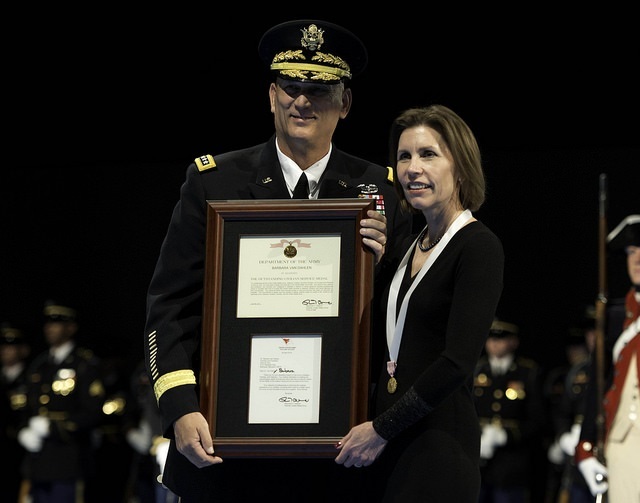 Give an Hour™ (http://www.giveanhour.org), a national nonprofit organization providing free mental health services to members of the military, veterans of Iraq and Afghanistan, their loved ones, and their communities, is proud to announce that its founder and president, Barbara Van Dahlen, Ph.D., was honored with the Army’s Outstanding Civilian Service Award. Dr. Van Dahlen, along with Mr. Mike Duke (former Chief Operating Officer and current Member of Board of Directors for Walmart), Mr. Roger Goodell (NFL Commissioner), and Mrs. Cheryl Jensen (Executive Director, Vail Veterans Program) were presented with the Army’s Outstanding Civilian Service awards during a day-long celebration yesterday in the nation’s capital. Presenting the awards was General Raymond Odierno, Chief of Staff of the Army. In recognizing her, the Army noted that Dr. Van Dahlen is a "clear advocate for Soldiers and Families and a positive force for the military." The Army thanked Dr. Van Dahlen for using "her passion and profession to mobilize her colleagues to voluntarily provide free mental health services to veterans, Soldiers, and family members during a time when these services are needed the most and there is a shortage in the military health care system." “Give an Hour and the leadership of the Army share the perspective that no one organization can address all of the needs of our nation's service members, veterans, and military families,” says Dr. Van Dahlen. “The men and women who serve our country are our husbands, wives, children, co-workers, neighbors and friends. It is up to each of us to do what we can to support them. To be recognized by the Army for my contribution as a civilian to this collective effort is a tremendous honor. Much remains to be done to ensure that all who serve have the opportunities and assistance they need and deserve – we are up to the task”. Give an Hour is a nonprofit 501(c)(3), founded in September 2005 by Dr. Barbara Van Dahlen, a psychologist in the Washington, D.C., area. The organization is dedicated to meeting the mental health needs of military personnel, their families, and the communities affected by the ongoing conflicts in Iraq and Afghanistan. Give an Hour has nearly 7,000 providers across the nation—in all 50 states, D.C., Puerto Rico, and Guam—with more volunteer mental health professionals joining its network every day. In addition to counseling, providers also consult to schools, first responders, employers, and community organizations. Give an Hour has already provided approximately 112,000 hours of free service, valued at more than $11 million. To learn more, visit http://www.giveanhour.org or connected.giveanhour.org.